The front left tail has been turned under and custom hemmed presumably for player comfort. You can see the top of the original Sand-Knit tag reading size “50”. 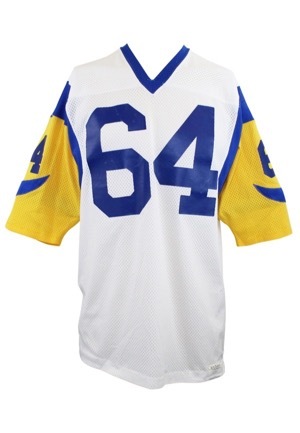 Half of the “Designed & Tailored Exclusively for the LOS ANGELES RAMS” tag is visible from the front with the custom hem sewing right through it. 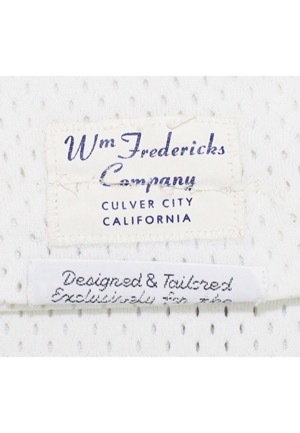 Adjacent above is the “Wm Fredericks Company” distributor’s tag. 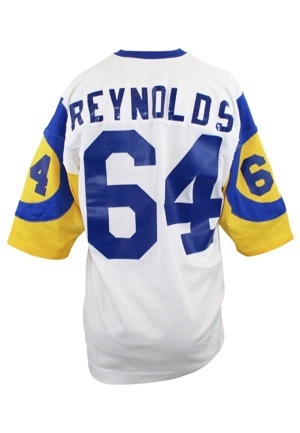 Across the front, back and on both shoulders is the player number “64”. Across the back on a white nameplate is the player name “REYNOLDS”. All numbering and lettering is done in the same blue vinyl lettering. There is a large repair done on the left shoulder. This jersey is properly tagged, was presented to us as game-used and in our opinion shows excellent use.